Occupation: Student at Cal. Tech. Base of Operations: His father's warehouse in New Jersey; Cal. Tech. Powers/Abilities: Computer whiz, great programmer and hacker, anarchistic, fearless. 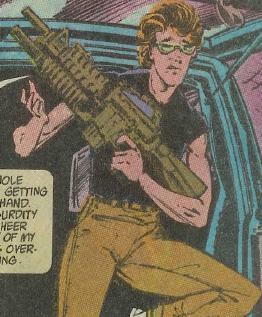 (Punisher: The Origin of Microchip #2) - Louis was the son of Linus Lieberman and Jan O'Reilly. The two had been a couple in college, but Jan had left Linus after he had gotten into trouble with criminals. Linus had known that Jan was pregnant, but he respected her wishes of staying out of danger and severed contact with her. Still, he followed their progress by way of various information sources, knowing she had married a Mr. Frohike, and that she had had a son, Louis. Linus kept tabs on Louis, noting that he won a science scholarship in high school. One day Linus, now known as Microchip, received a message from Louis, who had no idea that Micro was his father. From Upstate College, Louis requested a copy of the virus Leonardo, which Micro had created. Later still, just after Micro had joined forces with the Punisher, he returned home to find Louis waiting for him. Louis recognized him as his father. (Punisher II#4(fb) - BTS) - From age 20-22, Junior had helped his father tap into the National Crime computer for Frank Castle, the Punisher. (Punisher II#4)- At Microchip's warehouse in Jersey, Microchip introduced Frank Castle to his son, and told Frank how Junior had been helping him with programming. Junior told Frank that he studied at Cal. Tech. Microchip and Frank left Junior for awhile, Frank said "He doesn't look much older'n twenty", whereto Microchip answered "Twenty-two. Don't sweat it. Junior knows the score. Who do you think tapped into the National Crime computer for you, over the last two years?" When Frank returned to the warehouse to learn more about the "Church of the Saved", Microchip and Frank asked Junior if he could break into the F.B.I, to read their files on "The Church." Junior told them that they have an alarm system, being paranoid. His attempt failed. He told Frank that if he wanted to learn more about "The Church" he would need to find a cop named Ray White. Frank asked Junior if his father had told him about what he does, whereto Junior answered "No, man. All I know, you buy our stuff, use it to kill criminals. Big guys-- white collar guys. That's it. But I dig it." Frank told him it that it wasn't a game working with him and that it wasn't safe, whereto Junior answered "I hate this #@%* whitebread society. Tear it up. You do your part. I'll do mine. I know it ain't no game." Later after having talked with Ray White, Frank returned to the warehouse where he asked Junior if he could make him a new identity for use in getting into "The Church." Junior told him that putting something into the army records was easy, but putting something into the National Crime computer was tricky. They decided to give him an identity as Joe Rainey, an old Vietnam soldier whom Frank knew, who had been killed in action. (Punisher II#6) - When the Rosetti Brothers truck showed up at the warehouse where the Punisher was staying and he found the bodies of some of the Rosettis, he went to see Microchip and Junior. Junior tried to get into the New Jersey Justice department's computer all morning. At last he managed to get into the computer, and he told Frank that UNISYM had been under Justice Department investigation for three months, and that the C.E.O Harold Magary had ties to the Mecozzi Crime Family. Based on the information gained by Junior, Frank decided to investigate UNISYM. (Punisher II#8) - After a meeting with the bum Quentin O'Toole, Frank got into the van, and ordered the driver, Junior, to follow the car with Roky Vance and Sijo. They drove for nearly two hours, and arrived in Warrick county, Connecticut before losing them. They called Microchip to get help learning where they might have gone to. While waiting for Microchip to get back to them. Junior asked Frank why he didn't go after the Slasher, whereto Frank told him that it was a value judgment, he couldn't be everywhere at once, so he needed to make priorities. Microchip called back and informed them that they might be at Microcorp, a subsidiary of Praxdorf. They drove there. While Frank left the van to get a closer look at the building, Junior stayed in the car. When one of Takegura's bodyguards was about to finish off Frank, Junior came to the rescue. He tried to stun the bodyguard, but was knocked out by him. But this gave Frank the time he needed to defeat the bodyguard. He took the unconscious Junior with him back to Microchip's warehouse. At the warehouse, Frank told Microchip that he thought Junior had a concussion and a broken jaw, and told him what happened to Junior. Junior woke up, asking them what happened. His father told him that he had put Frank in danger, but Frank said "He didn't put me at risk. He saved me." (Punisher II#9)- At the warehouse, Frank told Junior that he shouldn't be walking or talking, whereto Junior answered "It only hurts when I laugh..." His father arrived and told him to stay in his bed, and if he couldn't follow orders he would be out of the operation. Later after Frank has captured Takegura, he took Junior with him to the meeting place, where they were to exchange Takegura for Roky Vance. He sent Junior to his position armed with a gun. Unfortunately, Junior was attacked by a ninja and cut down. 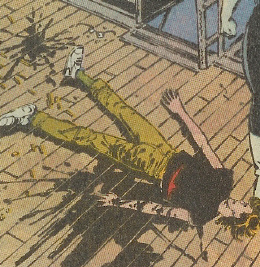 The Punisher discovered his body, and asked himself how he could explain it to Microchip. After having finished off the rest of the criminals, Frank brought Junior's body home to Microchip. Comments: Created by Mike Baron and Klaus Janson.